LED Drivers are used to drive High Power LEDs that require more than 100 mA current. A typical 1 watt LED consumes around 100-300 mA current while a 10 watt LED consumes 600 mA to 1 Amps current. So a resistor to drop the current is not sufficient since it heats up when high current passes. 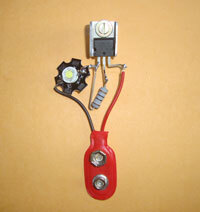 Moreover, the high power LEDs require a Constant Current to give steady brightness. So LED Drivers are used for this purpose. A typical LED driver has two sections. An SMPS converts 220V AC to DC and a Constant Current Generator Circuit provides Constant current to LED. But LED Drivers are costly units and the cost range from Rs. 150- Rs.600. 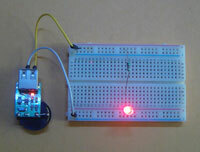 We can make a Low cost LED driver just for Rs.15. Try it. You can carry this Portable bread board power supply to do electronics work outdoor. Keep this in your bag along with some components so that you can enjoy the holidays with the fun of electronics. This Mini bread board is powered by a 3 volt Lithium cell. A DC-DC booster Module converts the 3V to 5.1V for the Bread board. You can also enjoy Music from MP3 player, or even charge your Mobile Phone from the Power supply. So make this three in one power supply. Its cost is Rs.150.